General Gutters is in every way a South African guttering company. A dynamic seamless gutter manufacturing company diversified by an enthusiastic team. Our confidence is in our ability to deal professionally with guttering challenges and present solutions. It is the result of many years of experience with guttering. Guttering solutions are available to the potential customer which will be carried through from the design to the installation of the gutters by the teams. Our effort is to please all of our client's guttering needs. For your convenience we are based in Kempton Park, Gauteng, in the centre of the Gauteng area. We can with ease cover all of Gauteng, incl, Randburg & Pretoria. We cover Gauteng, North West, Limpopo, Mpumalanga, Orange Free State, Northern Cape and Northern Kwa-Zulu Natal. With enough guttering teams available to do the installations, we are able to satisfy the huge demand for our gutter products and services, and handling the larger gutter installation contracts with ease. We also do maintenance on existing gutter installations, such as cleaning of the gutters, re-aligning of gutters, sealing of gutters. Often it is not necessary to replace a seamless gutter installation, especially a seamless gutter system. It could only require some maintenance, and we will help revamp your gutters. The gutters are seamless (no leaking) from corner to corner, therefore presenting a neat uninterrupted line against the roof. We roll form the gutters on site from a pre-painted colour bond (no painting ever) coil into the ogee profile for strength and a timeless aesthetic finish. We use the industrial gutters for predominantly for larger roof surfaces, and will suit most gutter applications and requirements. The domestic sized gutter is suitable for most houses and will be effective in most applications. Both sizes of the gutters get attached with serrated galvanized nails to the roof timbers using concealed internal aluminium hanger brackets placed at approxamately 1200 - 1500 mm centres. The ability of the gutter to carry rain water from the roof with the available positions of the downpipes determine the size of gutter and downpipes to choose. The corners are mitre - joined, pop - riveted and sealed with a UV resistant silicon sealer to prevent leaks. Profiled end-caps are fitted to the ends of the gutter and sealed with silicon. The gutters are fitted as level as possible, the roof levels permitting, with aesthetics as first consideration and function and drainage as second. The downpipes are placed at optimum positions as required by the gutter system and determined by the accuracy of the roof. Ground drainage is considered when placing the down pipes, as well as the aesthetics. The size and the position of the downpipes on the gutters are mostly determined by your preference, while water volume is taken into account. 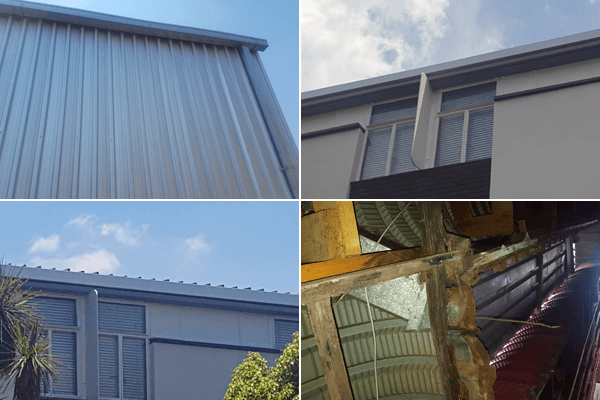 Any roof, such as saw tooth Factory warehouses, Homes , Office Blocks, etc can make use of a box gutter in a special application. We specialize in the replacement and installation of these challenging gutter systems. A different approach is often required to overcome these often difficult gutters’ positions. We can use different materials to give you the peace of mind when these gutters need replacing. We will service and clean old and new gutter installations and report back should any special attention is required for the installation. One of the major reasons for gutters failing to perform is neglect to clean them out regularly. Often it is also difficult to reach the high places. This is where we come in. We have the equipment to clean the gutters and assess the requirements. Our well-trained and professional gutter installation crews are fully dedicated to provide you with time-tested and cost-effective guttering solutions to all your drainage needs. 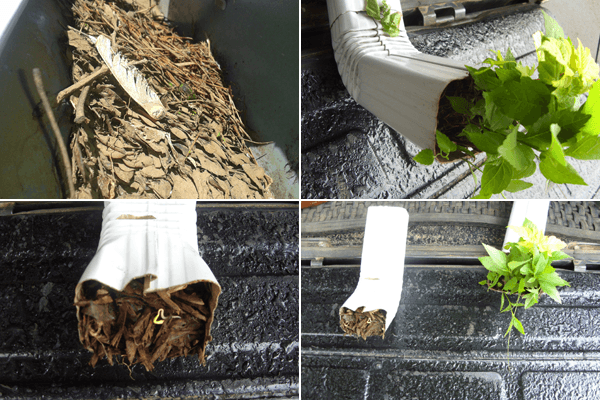 Don’t let another rainy season compromise the efficiency of your rain gutters and downpipes. Give us a call today and let our experience go to work for you. 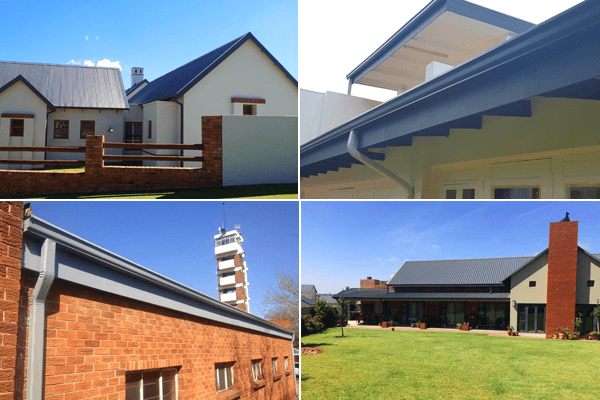 Our mainline gutter products are seamless gutters, roll formed on site from pre-painted coils of Colorlume•, a zinc and aluminium alloy, profiled in a modern and timeless "Ogee" style. Gutter internal hanger brackets are concealed inside the gutter, enhancing gutter aesthetics and preventing unsightly finishes. Gutters are installed as level as possible, giving first consideration to the aesthetic appearance and then to function of the gutters. Gutter corners are mitered with corner formers and sealed with UV resistant silicone. Blind rivets are used to keep the gutter corners together. Downpipes / downspouts are available in (100mm x 75mm) rectangular, (75mm x 50mm) rectangular. We also do specialized box gutter systems, boxed gutters in various sizes and other applications with rainwater heads (hopper boxes). These are measured and made up to specification. Most gutter installations take one day to complete from start to finish, and larger house require more time, Access and difficulty determines the time spent on most gutter installations. We Endeavour to inconvenience the client as little as possible when we replace the gutters. An added service we offer are Nutec• fascias in various sizes and barge boards to roofs. We can fir or replace fascias behind the gutters, and “L”-shaped barge boards on the roof apexes. The roof will be high pressure washed with water to remove dust, dirt and grit. Should it be necessary a weak fungus solution will be used to remove the fungus. Up to 30 tiles, (if the make is available) will be replaced should it be required. Ridging cement will be checked and fixed with a specialized patching solution, filling up cracks and open patches. A roof tile sealer is applied in the first coat with the airless spray gun for bonding. The roof will be sprayed with an airless spray gun, or brush painted to cover with the colour specified with Universal’s roof paint. Only loose paint will be scraped off on inspection. Application of roof paint to cover is done with a brush to the roof surface.